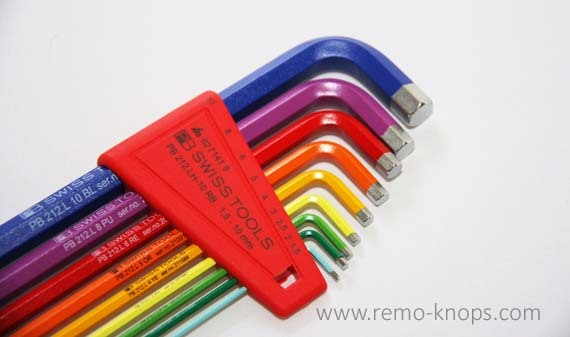 The PB Swiss Tools 212LH-10 RB is PB Swiss Tools rainbow color coded hex key set, is a high quality set of allen keys with ball-ends that is used by many mechanics in the professional peleton. In this article I will share my personal experiences since I own a set of PB Swiss Tools long allen keys for over 15 years, and still in perfect condition. Contains nine color coded sizes in red plastic holder: 1,5 mm, 2 mm, 2,5 mm, 3 mm, 4 mm, 5 mm, 6 mm, 8 mm and 10 m. The color coding top layer is powder coated, and has a grippy finish (feels a little like rubberized). The normal hex heads on the short end of the L-wrench are not powder coated as you can see in the picture below. David Rome, wrote an interesting article on Bikeradar before he started working for Cyclingtips in 2016: “Allen keys: everything you need to know“. The article goes into the tolerances of different brands, and provides an overview of the different types of allen/hex keys. My personal experience is that I can fully underline that I’ve never damaged a bolt with the PB Swiss hex keys. The ball-heads have a good grip, while the length of the PB Swiss Tools 212LH-10 RB are pleasant and give you tremendous power when needed. A recent addition is the PB Swiss Tools 470 Adapter, that can be attached to the 5 mm allen key and gives you the ability to put 1/4″ bits into the adapter. The picture below shows two sets both with the adapter. As mentioned in the PB Swiss BikeTool and 470 Adapter review I have a set of PB Swiss Tools allen keys that are over 15 years old , but still in top notch condition despite intensive use. I purchased a second set specifically to have all my important bike tools together stored in a set of BERA CLIC+ toolboxes. 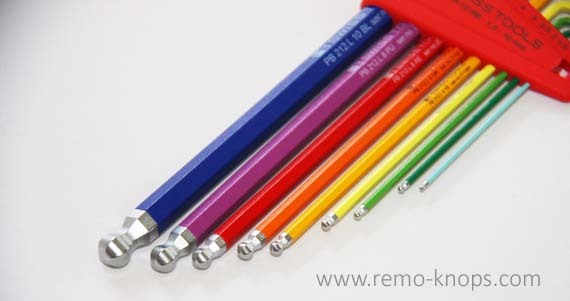 This rainbow color-coded version I bought as a present for a friend, and bought the PB Swiss Tools 212LH-10 RB at Prof-Tools for a price-point of just below € 35,-. For such a high quality set of allen keys this is a bargain, that you won’t regret. PB Swiss Tools 212LH-10 RB – Rainbow long hex key set ended upon Cyclingtips “Ten products I loved in 2016” articles from both David Rome, just as the Oakley Radar EV Prizm Road that I’ve reviewed a little while ago. So if you are in the race for a new set of good hex key than get the PB Swiss Tools 212LH-10 RB bargain from Prof-Tools. 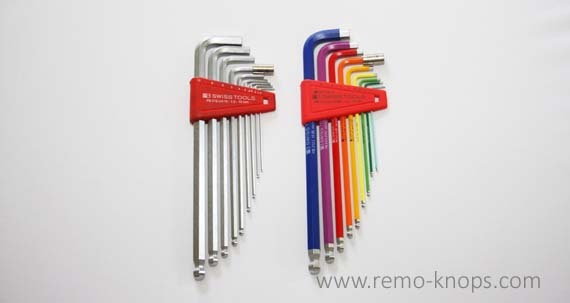 Hey!, I found this information for you: "PB Swiss Tools 212LH-10 RB – Rainbow long hex key set". 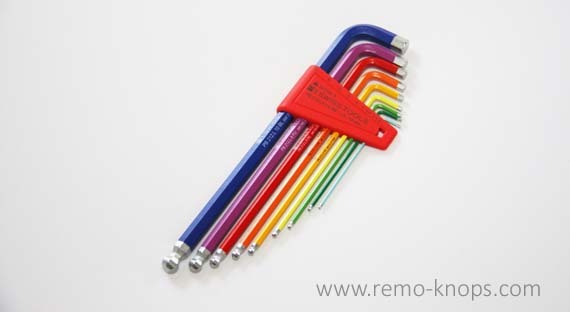 Here is the website link: https://www.remo-knops.com/6435/pb-swiss-tools-212lh-10-rb-rainbow-long-hex-key-set/. Thank you.